I hope you enjoyed yesterday's post on How I Became a Beauty Blogger. It's important to read that first, so you can get some background on today's post. The question I get asked every week is "How Did You Become a Makeup Artist and what advice can you give me for becoming one?". I often get this question from a lot of viewers and of course i'm happy to answer. I think it's about time that I finally make a detailed post on it. As you all know, my passion for makeup turned into a beauty blog. Having a blog really steps your game up to another level. You try to challenge yourself to do new makeup looks and techniques. As a youtube Guru and blogger, I do feel a little bit of responsibility to help others with makeup. Sometimes, I feel like I do the same kind of look and push myself to do something different and show my viewers new ways of doing things. I did a lot of research on the web, learning techniques from other beauty bloggers and watching countless youtube videos. To this day, I try to learn at least something new every day. After doing my blog for several months, I started to feel pretty comfortable doing my own makeup. My boyfriend told me, "Why don't you start doing this Professionally on other people?" When he told me that, I was like "What, I'm not ready!". I can definitely say that doing makeup on yourself is a lot different than doing makeup on others. However, he had ignited a spark. Now, my research turned to doing makeup on others. I find that with the influx of beauty blogs and youtube pages, a lot of people try to go out there and become makeup artists without the proper preparation and practice. This is hard for the actual artists out there who have the professional products and expertise. Newbies often undercharge for their services making it hard for pros to get the rate they deserve. I always tell clients though, you get what you pay for. If a makeup artist asks you to bring your own foundation for instance...that's a problem. 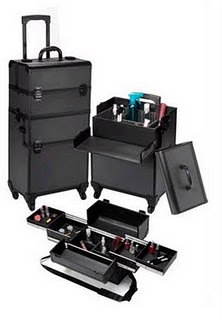 Makeup Artists should have a complete kit...but i'll get into that later. A lot of people ask me "What Makeup School Did You Go To?" Well, I didn't...I'm completely self-taught. I'll admit, the internet has made it so much easier for aspiring makeup artists to learn tips and techniques not possible before. However, that doesn't mean that you can watch a few YouTube videos and run out there. I spent countless hours on the web, learning topics such as: applying mascara on others, how to build my kit, how to sanitize makeup, how to work with older skin...etc. I even had a huge book filled with notes, printouts and pictures which I referred to daily. My point is that Makeup School is a viable option for many, but not completely necessary. If you choose the route of learning yourself, you have to put in the same amount of time or more that you would spend learning at a makeup school. Of course research only takes you so far. You really need to practice. I asked all my friends and even their moms to be my models. Actually doing makeup and practicing is where you learn the most. You make mistakes along the way and learn from it. When I first started practicing, it could take me over an hour and a half to do a face...practice helped me to ween that time down to 20 minutes if necessary. Try doing makeup on a variety of ethnicities and ages so you can be a more versatile artist. I also made sure to build my kit along the way. I'm not going to lie, it's a big investment costings hundreds and thousands of dollars. Looking back, I probably could have bought more efficiently. Oftentimes, I'd run to MAC spending hundreds of dollars...completely ignoring other great professional brands. I highly recommend that beginning artists buy in palettes...it's cheaper and most cost effective in the long-run. I love sites like http://www.camerareadycosmetics.com/ because they tailor to makeup artists and offer those great pro brands that I love. A lot of us are makeup junkies and have dozens of eyeshadows and lip glosses. But as a professional, you really need to start separating your personal stash from your kit. This is where sanitation practice comes in. Once I felt comfortable, I decided to put myself out there. I advertised online and on craigslist. Eventually, I got my first gig! I was so nervous but my motto is "Fake it till you make it". Keep your composure and if you make a mistake, no need to alert the client, just fix it. That's the good thing about makeup, it wipes off. The cool thing about this gig was that the client posted an online review of me on http://www.theknot.com/ which got me a lot of referrals! It's important to have a positive interaction with your client...after all this is a service industry. Forming these kind of relationships can get you repeat clients and referrals. From there, I started booking more and more clients. Sure I had my ups and downs - sometimes no clients and sometimes I was super busy...but that's the nature of freelancing. It really helped that I had a blog and YouTube page since my viewers often sought me out and booked me for appointments. In the meantime, I continued to post videos and entries and still practiced practiced practiced. At the same time, I knew I had to work on my portfolio. I always requested that clients send me pictures of their makeup if they were taking professional pictures. I also made sure to keep my digital camera on hand for before and after pictures. It's also a great idea to do TFP shoots...doing makeup in exchange for pictures for your portfolio. I try to learn something new from every gig. It's been about 2 years since I started freelancing and i've learned so much during that time. In that time, I've attended makeup seminars...took on airbrushing and built a website. I've done weddings, fashion shows, makeup lessons, makeup parties, photoshoots. I've also met and worked with many great photographers, makeup artists and models. The key is to keep pushing yourself and growing each and every day. I hope this helps some of you all. Please feel free to leave any of your own advice in the comments section. Check out tomorrow's post for my advice for aspiring makeup artists. wow. cheers to you in your incredible journey! Ohhh wow! Thanks for this post, it was so inspiring! Ren this is so helpful, I can't wait for tomorrows post, I have to network more to get more. soo true about bringing your own foundation. and i totally do that. ONLY because I have yet the funds to invest in it!! but SOON!! When playing around with makeup on friend it takes over an hour, so this is motivating to see that i can only improve. Great post. This was very helpful, Thanks for sharing. I read your blog all of the time. Our stories are very similar, except I am just now starting to take this seriously. I REALLY want to be a freelance MUA. I'll be following you more & more. I love the makeup you do as well. Keep up the great work! this post really was helpful! great post and you are such an inspiration!! I wish you all the best and more growth/success/referrals!! thank you for this post!!! <3's it and it was very helpful!!! this is really inspiring. u are so talented. hopefully one day i can be like you. i was like you in the beginning, not ready to 'take that first step.' but eventually i did and landed my first gig. i work with MAC now part time and i really wanna set time aside to do freelance work. i love it sooo much! i'm gonna start advertising on craigslist soon and have my past clients write a review of me on theknot.com thanks so much! Thank you for sharing your experience. Truly an inspiration of making things happen. In a lot of ways, people keep holding back with fear of failure or disappointment but you have march on with courage and kind enough to share your gift in beauty. Keep up the good work. Thank you for sharing RenRen! I have been thru a lot of similar experiences except I started working on faces long before blogging! I love your style! I also love your story and you really have a great journey. It is very inspirational and I know that there are lots of people who also want to become a makeup artist.